Mike Castellana topped Shane Molinari as Pro Mod’s biggest stars invaded Lucas Oil Raceway Indianapolis for the Night of Thunder. Mike Castellana, last year’s second-ranked driver in the E3 Spark Plugs NHRA Pro Mod series, drove to an impressive victory over a talented field of Pro Mod racers during the inaugural Night of Thunder at Lucas Oil Raceway Indianapolis. 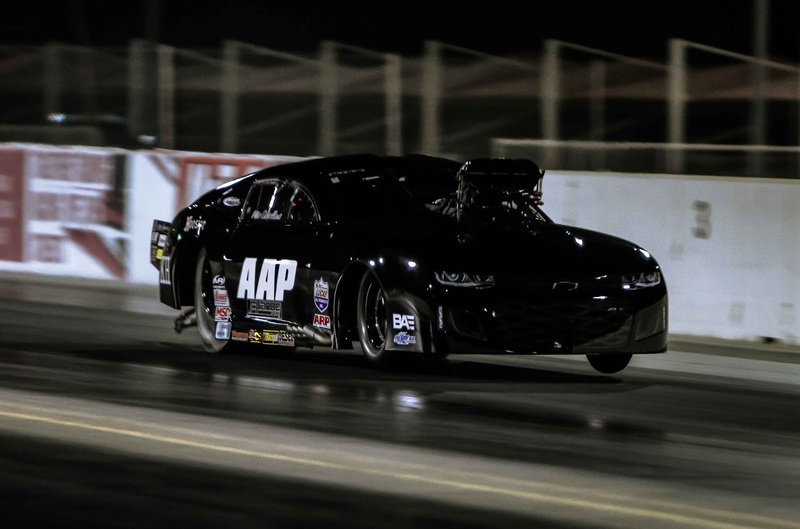 In a battle of the top two qualifiers, Castellana in his supercharged Frank Manzo-tuned AAP Camaro, got the best of Shane Molinari and his turbocharged Pontiac Firebird in the final. Both drivers were on and off the throttle during the action-packed final, and the win light shone in Castellana’s lane with a 6.080, 2.45.04 to a 6.142, 243.33. Castellana, whose Al Anabi Performance team is based just two mile from Lucas Oil Raceway in nearby Brownsburg, Ind., was the top qualifier with a 5.887 and made a pair of consistent runs in eliminations with a 6.888 in his round one win over Steve Matusek’s Aeromotive Camaro and a 5.935 to slip past Dan Stevenson, in his turbocharged Camaro. Molinari, last year’s No. 4 finisher and the winner of the 2017 Norwalk race, was even more consistent with back-to-back runs of 5.924 and 5.922 to get past Billy Glidden and Clint Satterfield. The Pro Mod cars were just a small part of the Night of Thunder event, held on the eve of the historic Indy 500. Many of the stars of the NHRA Mello Yello Drag Racing series were also on hand including Eddie Krawiec, Andrew Hines, and Ryan Oehler, who made exhibition runs on their Pro Stock Motorcycles. Nitro Funny Car racer Jonnie Lindberg drove his championship-winning Camaro Top Alcohol Funny Car to a win over the injected nitro dragster of third-generation racer Krista Baldwin. The ultra-competitive Vance & Hines riders put on a great show with Hines narrowly edging teammate Krawiec in the final round battle of Harley Street Rods. Krawiec was almost perfect off the starting line with a .003 light but Hines drove around him for a 6.926 to 6.968 victory. Krawiec quickly swapped his Pro Stock Motorcycle leathers for a fire suit to drive his turbocharged x275 drag radial Camaro to a win over Richie Crampton’s street-legal ’57 Chevy wagon.